disclaimer: I was not involved in the design, construction, or operation of the radio transmission systems - other team members were responsible for that. Below are only tips from my limited experience with the system. HF is the other transmission system option. HF communication involves using a powerful high frequency transmitter to transmit GPS coordinates and any other pertinent information. The main problem with HF communication is that it requires a big antenna and takes up a lot of power and weight. We used regular CB radios implementing the APRS Automatic Packet Reporting System. However we replaced the antenna with a much longer one to increase range. Tracking data was plotted in real time over Google Maps. 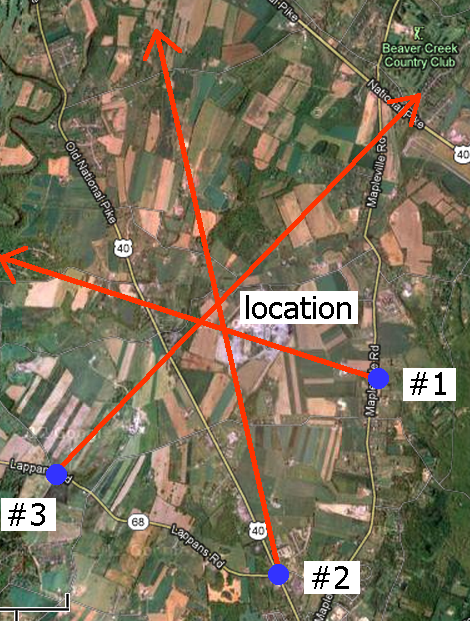 This APRS google map shows our tracked flight in late 2011, and also shows all the stations that picked up our signal. Transmission power of 0.5W to 1W for line of sight communication should be sufficient. Be sure to test your transmission equipment range before flying it. Mountains can block signals, so if that's a possibility, you may want higher transmission power. Your space package will be continually spinning and as such not be able to control the antenna direction. This will require a basic dipole antenna because of its uniform radiating pattern. I have read that J-pole antennas have also been successfully used. In the space photography tutorial I quickly summarized how to transmit live video. As I haven't done this I again won't go into detail, but it's possible to interface a microcontroller with the video feed to add in data within the video itself. This is pretty common with the POV hobbyist crowd, where they fly model airplanes with onboard cameras and transmit data such as battery voltage and what-not. How about using an STX2 simplex transmitter unit from GlobalStarUSA.com. It's already designed for that purpose and can track your balloon anywhere in the world (one-way transmission to LEO satellites). It's very small and lightweight and is easily interfaced to your CPU, GPS, and other communication hardware. It's commonly built into global asset tracking devices. On an OEM basis, it's well under $100. For quantity one (engineering purposes), you should probably talk to Bob Bennett at GlobalStar (see their website and look for the simplex transmitter unit). Another cost for the satellite tracker beyond the transmitter unit is a subscription to the monitoring service. This could be a cheaper option - http://www.findmespot.com/en/ I have a couple of those trackers (SPOT Messenger). They work very well. I have an annual unlimited plan (something around $100 per year). The other beyond line of sight option is a cell phone transmitter, allowing for communication anywhere there is a cell phone signal. But cell phone signals do not exceed ~10k feet - a problem as missions often exceed ~100k feet. The following images demonstrate how everything was physically assembled. We used pegboard cut to size for firmly mounting the antenna (pegboard is typically used for mounting tools on your wall). We drilled a small hole in the center, mounted the antenna through that hole, and then protected the antenna from rough abrasion using black duct tape. This is also how we mounted the cameras - all cameras have a small screw hole on the bottom for tripod mounting. One of our transmission systems used a Radiometrix VHF narrow band FM high power Transmitter. It was mounted onto a custom circuit board. The custom board is two-sided, it also has a built in microcontroller, GPS, and other goodies. In this below image you'll see the board wired up to the transmitter (the CB radio; located at the bottom of the image). We used two independent transmitters operating on different channels (shown below). They are insulated and protected in custom made boxes of poster-board foam-core. The box shapes make everything fit together really well, and prevents buttons on the transmitters from getting accidentally pushed during launch preparation and during flight. It is always good to have a directional antenna for when your space package gets lost. This particular flight had a temporary problem with the GPS coordinate transmission, so we took a break. Fortunately, this skilled operator was able to determine the balloon location. "It is in the 'up' direction," he said. note: Direction finding antennas was the old-fashioned way to track balloons - before GPS was small and affordable. By getting readings in multiple locations one can use triangulation to locate the signal source. image: where did the darn thing go?! To use this method, randomly point the antenna to determine the direction that results in the 'loudest' signal. By using a compass, draw a straight line on your map corresponding to this direction. Next, drive in a direction perpendicular to this line for a few miles, then do it again. And finally, drive a few miles perpendicular to this second line and then draw yet a third line from the third reading. The intersection of those three lines will form a triangle and marks the probable location of the signal source. This should go without saying: having multiple people with antennas in different locations makes tracking much faster, and much more accurate for moving targets. Radio operators love the prospect of being able to track a near-space balloon. Put word out in the community about when the launch will be, expected trajectory, frequencies, etc. Their data will help you track your balloon, especially for long distance flights where driving after the balloon isn't an option. You know, like cross-Atlantic flights . . .
Or even better recruit a hobbyist for your team. They're likely to have much fancier more expensive equipment (so you won't need to buy any). Their advice/input would be highly valuable, and they're likely already licensed to operate radios. Yes, operation of any HF radios requires you to be licensed (HAM radio license). It's really easy to do. Study for the test, take the test, pay the small fee, and that's it! More info can be found at the ARRL website. Only the operator of the radio needs to be licensed, not your entire team. But I still recommend everyone getting a basic Technician class license just for the educational value of it.